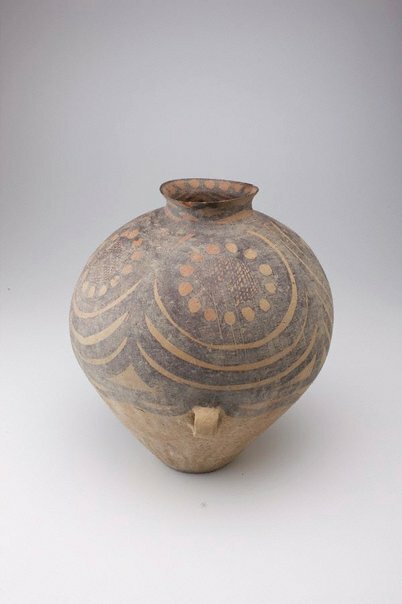 This earthenware storage jar is made of a reddish brown clay. As with most Yangshao storage jars from Gansu the surface decoration is confined to the top two-thirds of the vessel. Across the shoulder of the jar four evenly placed large circular shapes with red bands are filled in the centre with a crisscross design. The design is thought to be a development of the ‘four large vortices’ of the Majiayao phrase (3300-2050 BCE), but here, during the Machang phase (2310-2050 BCE), the ‘vortices’ degenerated into a more static but nevertheless highly symmetrical pattern. Asian Art Department, AGNSW, August 2008.